Avulstein Gray-Mane is a Nord warrior hiding out in House Gray-Mane in Whiterun. 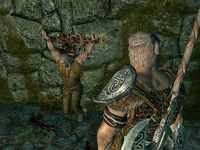 While his brother was reported to have fallen in combat, his family believes Thorald to have been captured by the Imperial Legion instead, and that the Battle-Borns are aware of this. Fearing for his own safety, Avulstein doesn't leave the house. He's dedicated to find out what happened to his brother, and will ask for your help during the quest Missing In Action. The bad blood between the clans has caused Avulstein to never show his face in public so he stays inside the house at all times, either sitting in a chair, sleeping or eating. While optional, Avulstein may leave the house during his related quest (see this section for full details). He wears a set of scaled armor with a matching pair of boots. He is equipped with a Skyforge steel battleaxe, and carries a key to the clan's house as well as a selection of common loot and gold. 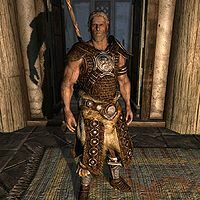 Once you have gained his trust during the related quest, Avilstein will also start to reveal his strong opinions, starting with Whiterun: "Forget Solitude or Windhelm. Whiterun was the crown jewel of Skyrim before... Well, before... Never mind." and "This was such a glorious city. But then everything had to change. The Empire came... and my brother was lost..." He will then move on to Skyrim and its rightful heirs: "Ah, but Skyrim! Skyrim is supreme among all nations! Our people, our native people, are unmatched in all Tamriel!" and "One day the war will end and the true heirs of Skyrim will inherit this great realm." As part of Clan Gray-Mane, he is the son of Eorlund and Fralia Gray-Mane, brother of Olfina and Thorald Gray-Mane, and nephew of Vignar Gray-Mane. The now rivaling families used to be best of friends, but all that changed with the civil war, where Avulstein's family took the side of the Stormcloaks and the other family chose to side with the Imperial Legion. When asked for a reason on how the two biggest families in Whiterun could clash like that, family patriarch Vignar Gray-Mane will explain: "Aye, we used to be fast friends, though it was long ago. We were two of the city's oldest an' most-respected clans, an' we could trace our histories all the way back to Ysgramor's companions. But then Olfrid got rich an' decided he an his kin were too good for us simple, backwards Nord folk. When the troubles began, he took the Empire's side. We haven't spoken much since then." Because of these political beliefs, any friendship between the clans has gone sour, as Idolaf Battle-Born will admit: "Avulstein Gray-Mane and I were best friends as children. If I see that traitor again, I'll throw him in jail myself!" Should you enter House Gray-Mane out of mere curiosity, and get too close to Avulstein, he'll force you into conversation: "Who are you? What are you doing here? Are you working with the Battle-Borns? Speak now before I put you in the ground!" "A likely story. They won't even do their own dirty work now, eh? Well, you won't get the better of me! Now tell me where my brother is!" Calm down. I'm not working for anyone. "No? So you don't know anything about my brother? Then what are you doing here?" "Thorald... Thorald Gray-Mane? Fighting for the Stormcloaks, disappeared and believed dead? You really don't know anything about this, do you?" I didn't mean to alarm you. Why are you so tense? "Because they've got Thorald locked away somewhere, and if they find me here I'll disappear too! I am not going to let that happen!" Sounds like you need some help. "I can't do this all on my own. Are you... are you offering to help me?" Fralia: "Welcome to our home." Avulstein: "Mother, what's the meaning of this? Who have you brought into our home?" Avulstein: "How do we know he's/she's not spying for the Battle-Born? This was foolish! We can't trust anyone! Who knows what they'll do if they find me here." After that, you can ask Fralia for elaboration: "Thorald's disappearance has been hard on all of us, but Avulstein has taken it badly. He's afraid of being taken as well, so he hasn't left the house. All he talks about is Thorald. Please, help Avulstein if you can. Something has to be done, or we're all going to lose our minds." Yes, absolutely. What can I do? "I know that Thorald's not dead. I just know it. The Imperials have him, and are keeping him somewhere. But I don't know where. Those damned Battle-Borns... they know something. They're hiding it. They practically taunt us with it. They must have some sort of proof! There's got to be something in that house of theirs. I just know it. I don't dare leave the house myself. So I need your help." I'm not even sure what's going on. "My brother, Thorald. He was fighting for the Stormcloaks, and went missing. Everyone assumes he's dead. But he's not. I just know it. The Imperials captured him, and they're holding him someplace. The Battle-Borns know where. I'd go and search their house for proof, but they want me too [sic]. I'd be captured, and then we'll never know what happened to him. So I need someone to find that proof for me." At that point, you are free to ask him some questions. If you ask him what proof he needs, he'll explain: "Anything that confirms that Thorald isn't dead, but is being held captive. I know those Battle-Borns have it. They'd be hiding it, of course. Wouldn't want it to get out that they've been lying this whole time. But you might be able to butter them up enough to lower their guard." When asked why he think the Battle-Borns are involved he will hatefully respond: "The Battle-Borns. The Emperor's biggest boot-lickers here in Whiterun. Their connections to the Empire and the Legion are well-known. When Thorald didn't return home, there was no question in my mind. 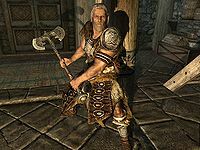 They knew Thorald supported the Stormcloaks, knew he was going to aid them in battle. Made sure he didn't come back. Locked him up someplace to get back at my family. I'm sure of it." When you return from the Battle-Born residence with the evidence in hand, Avulstein will greet you with: "Do you have news? Did you find something?" When you tell him that you have proof that Thorvald is alive and show him General Tullius’ request to the Battle-Borns, he will say: "I knew it! Let me see, please! The Thalmor? By the Nine, it's worse than I thought. So... Northwatch Keep. Then we know where to hit them." (NOTE: check the dialogue bit: "Well, where is it? Forgive me, but I don't dare just trust your word, no matter who you are.") When asked if he is going to attack Northwatch Keep he will make another request: "I'll do anything if it means saving my brother. You'll join us, won't you? Thorald can't be left to those... monsters." Your brother talked me into it. I've never known Avulstein to be that convincing! Where is the little scamp? Your family was concerned for you. Of course. I should've known. This was all Avulstein's idea, wasn't it? Where is he? I told him to wait in Whiterun. A wise decision, but I fear he may not be safe there anymore. They'll go looking for me, and Whiterun will be the first place they search. I cannot stay. Not here, not in Whiterun. It likely won't be safe for Avulstein, either. Our best hope now is to fall in with the ranks of the Stormcloaks. But would you do me a favor? Tell my mother to suffer the winter's cold wind, for it bears aloft next summer's seeds. She'll know what it means. If you chose to bring Avulstein along with you he will meet you at the lake east of Northwatch Keep with his friends Geirlund and Vidrald. When asked why he is there, Vidrald will explain his loyalty: I pledged to aid Avulstein and Thorald a long time ago. There's nothing that could keep me from helping them now. When you speak to Avulstein he will say: We're getting Thorald back, no matter what. He will then reveal his plan: We kill every Thalmor between us and Thorald, and we bring him out alive. Let's go. He will then follow you all the way through Northwatch Keep and keep his promise, slaying all the Thalmor you encounter. Thorald: Brother? Is... Is that you? Avulstein: I'm here! I knew I'd find you! Thorald: What in the world? Avulstein: There's no time. We've got to get you out of here! Come on, let's go! He must have been very convincing. Of course. I should've known. Avulstein was behind this, wasn't he? He will then finish the quest with: I cannot stay. Not here, not in Whiterun. It likely won't be safe for Avulstein, either. Our best hope now is to fall in with the ranks of the Stormcloaks. But would you do me a favor? Tell my mother to suffer the winter's cold wind, for it bears aloft next summer's seeds. She'll know what it means. When you return to Fralia, she will be grateful although a bit sad that both her sons had to go into hiding. If you ask her if she’s heard from them she will conclude: No, nor do I expect to. Would be too dangerous for now. It's enough for me to know that they're out there somewhere, and together again. Avulstein will be disabled from the game upon completion of the quest, although at different stages depending on your choices. If he was with you in Northwatch Keep, he will disappear when you talk to Fralia. If he stayed at home he will disappear when you talk to Thorlund. I'm... Well, who I am isn't important. Let's leave it at that, hmm? Best if... you didn't mention to anyone that you saw me here. Remember - don't trust the Imperials. No matter what honeyed lies they tell you. Thorald's disappearance has been hard on all of us, but Avulstein has taken it badly. He's afraid of being taken as well, so he hasn't left the house. All he talks about is Thorald. Please, help Avulstein if you can. Something has to be done, or we're all going to lose our minds.